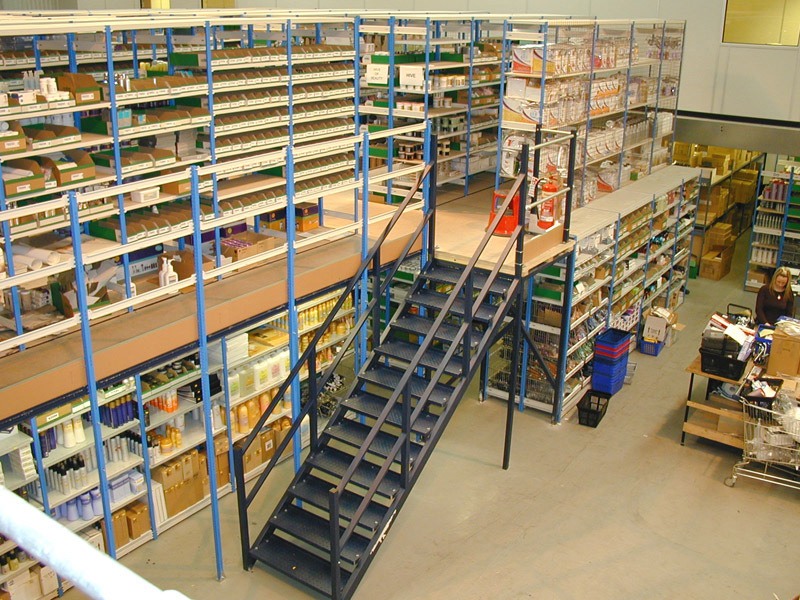 Two Tier shelving is a cost effective solution that utilises all of the available building headroom without the need for a separate structural mezzanine floor. 2 Tier shelving is best described as extra-tall shelving with a raised aisle that is suspended to create a walkway accessed by a staircase. 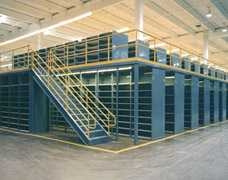 The photographs opposite show some typical applications where both the ground and upper floors contain racking that is used for storing products. 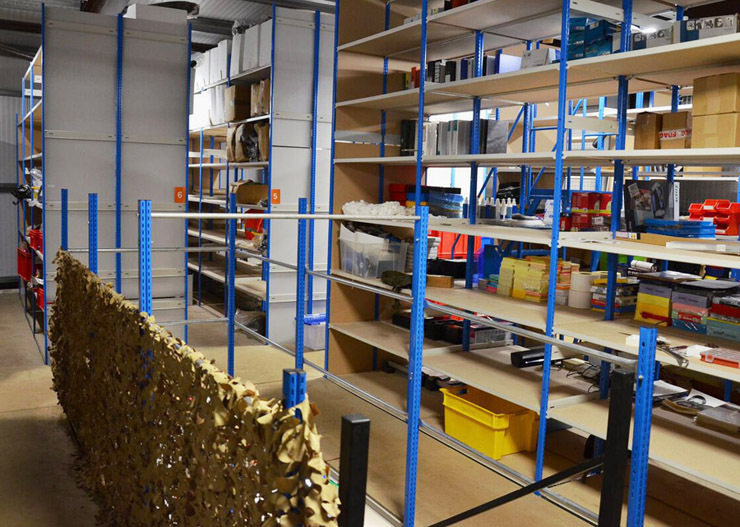 Heavy duty chipboard flooring laid in between the shelving bays combined with a robust staircase provide a very secure storage structure that is ideal for picking applications. 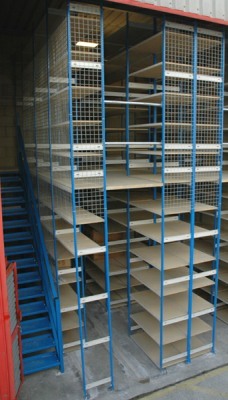 The adjustability of the shelving is still retained within a two-tier system like this thanks to the modular Trimline components used, each shelf can be adjusted vertically every 25mm which helps to create specific shelving areas to suit the stock being stored. 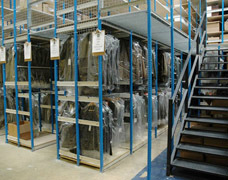 Space within a retail stockroom is usually very limited but still has to provide storage for many different product types whilst holding enough stock to supply demand. 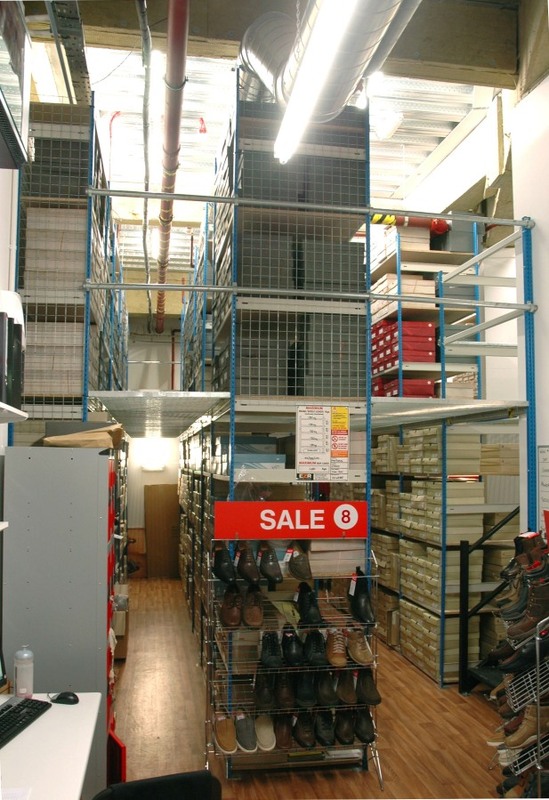 When there is sufficient headroom available, Two-Tier mezzanine shelving is the perfect solution for retailers providing maximum storage capacity whilst retaining easy access for staff members. 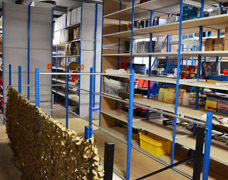 A choice of flooring types are available for 2-tier shelving to suit different requirements, although chipboard is the most cost-effective material, wire mesh flooring can be supplied to improve the effectiveness of sprinkler systems during the breakout of a fire. 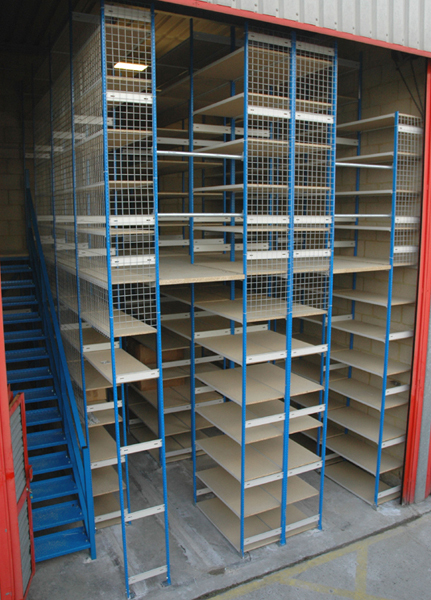 Raised aisle shelving does not usually affect the building's rateable value but does require building regulations approval and we can include this (if required) as part of the project. 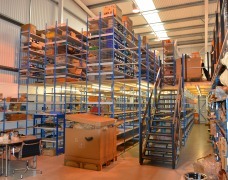 Contact us on 01993 779494 to discuss how multi-tiered shelving can benefit your business. 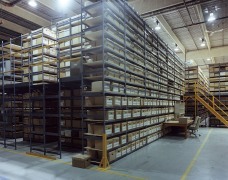 Mezzanine shelving systems (also known as raised aisle racking) can effectively double the square footage of your existing storage area by using the often wasted, vertical space. 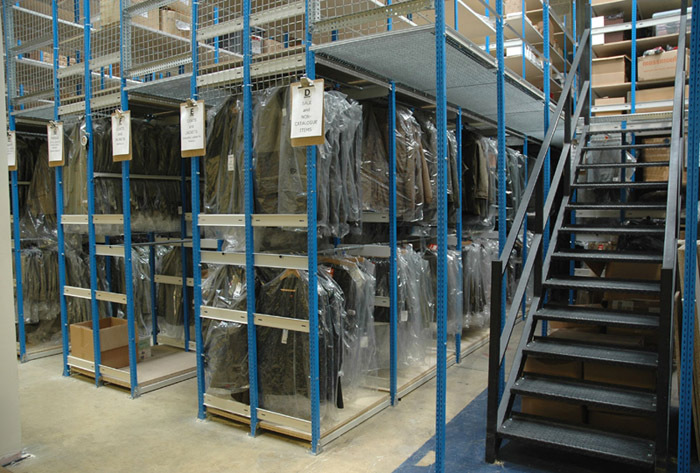 Raised aisle shelving systems are perfect for warehouses and distribution centres and are commonly used for archive storage or bulk parts and retail goods storage. 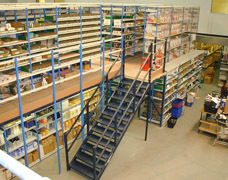 The ground floor shelving provides a basis to support the raised walkways, a metal staircase adds further rigidity to the whole structure and allows easy access by staff members to the upper levels of storage. 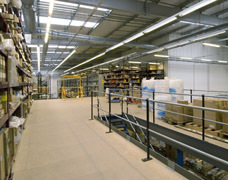 Because mezzanine shelving solutions utilise the full height of the building, there is no need for extra heating or lighting. 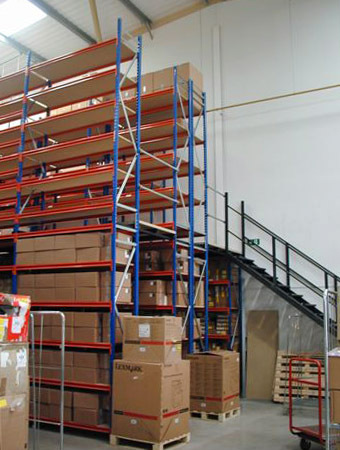 This combined with the savings of not expanding your existing warehouse or moving to new premises, makes it all the more cost-effective to use a tiered shelving system. 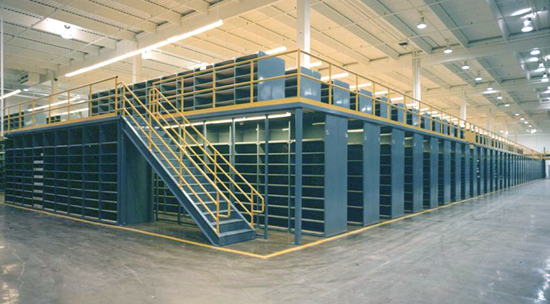 Mezzanine storage systems are best suited to big industrial units where they store high densities of documents or for holding stock ready to be picked for mail order fulfilment. 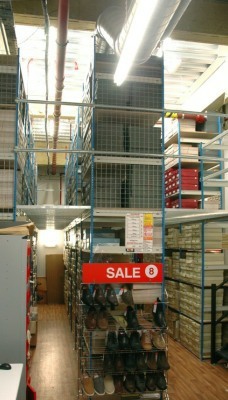 However, even smaller stockrooms can benefit from the stock capacity increase that mezzanine shelves provide - as long as there is enough ceiling height. 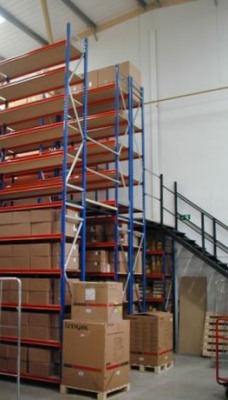 The bottom level of shelving is used as a support for the upper levels, because of this there is no need to build a costly structural mezzanine floor. 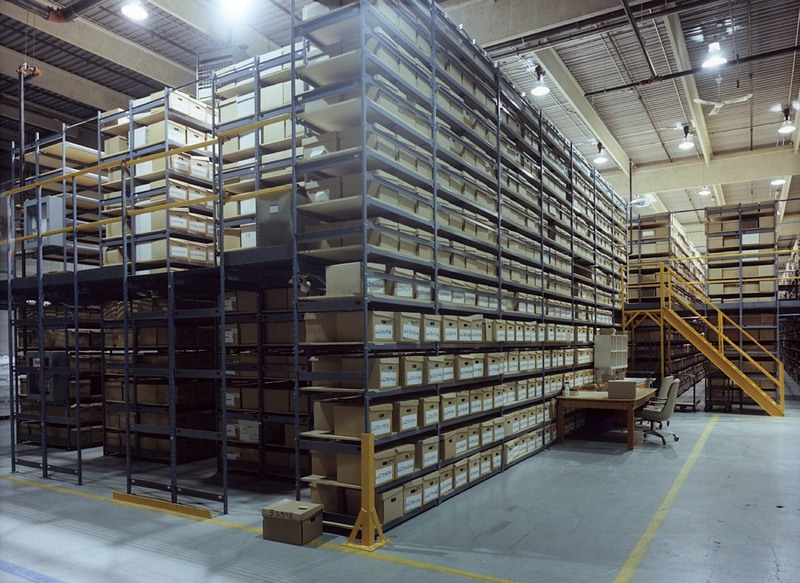 Rack supported floors are an ideal solution to create an open floor space above a shelving or racking system that can be used for bulk storage or additional shelving. 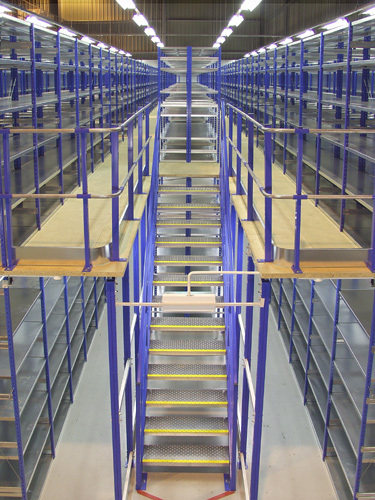 A floor over racking system is simply an area of shelving or racking with a lid on top that creates a floor accessed by a staircase. 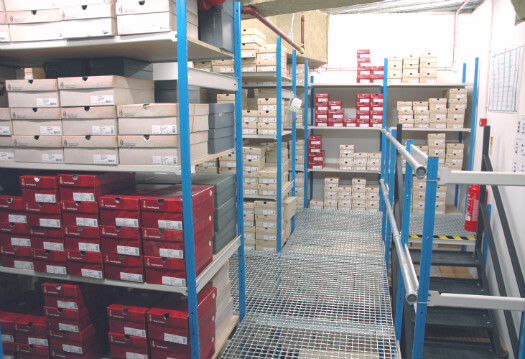 Rack supported floors are a cost effective way of providing additional floor space when shelving is being used at ground level and negates the need for a structural mezzanine floor. Raised platforms require building regulations approval and we can include this if required as part of the project. 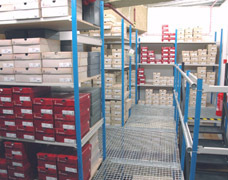 Rack supported floor can still have an upper level of shelving but this is independent of the lower racking and can be removed to create an open 'mezzanine' style floor area. 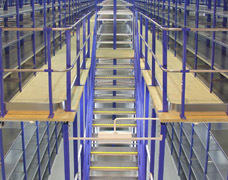 An effective way to increase usable floor space whilst making use of the available height in a warehouse or stockroom is to install a full mezzanine floor. This free-standing solution provides an upper 2nd floor level that can be used to either increase existing storage capacity or to create a lower level work area with storage above. 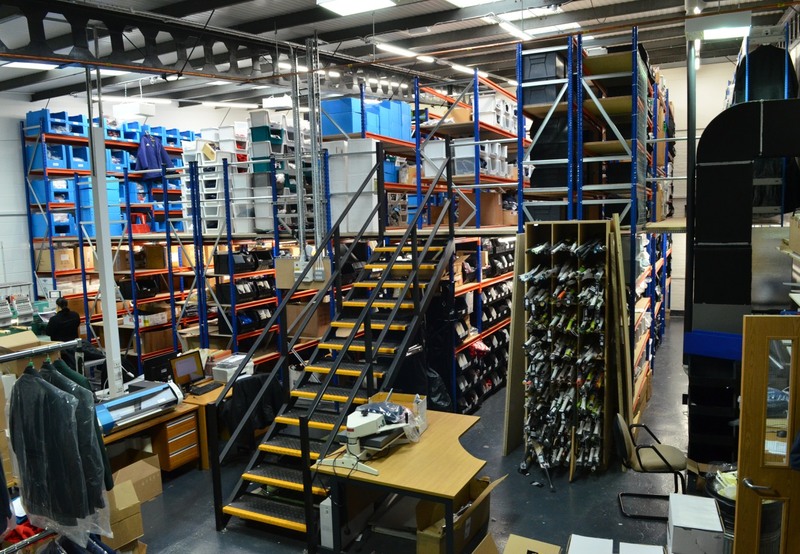 Mezzanine flooring is often added to a warehouse area to avoid an expensive relocation as a business grows, adding an extra level in this way provides a very cost-effective way of increasing storage capacity. Building regulations apply with all mezzanines and we are happy to include the application within our quotation if necessary. We have several PDF documents in our downloads section relating to the design of mezzanine floors and mezzanine shelving including the relevant building regulations. 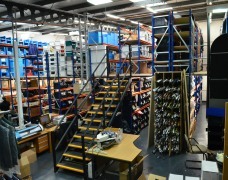 Please contact us if you need any further information regarding mezzanine floor design.